What is Democracy? Many people are mistaken about Democracy and sometimes, politicians (especially PAP) have deliberately misinterpreted Democracy to justify their dictatorial system as "Democratic". Sad to say, even politicians in Singapore's opposition parties, have little idea what constitutes "Democracy" and "Rule of Law". The following photo shows Obama giving a speech and those people have given him a standing ovation. However, there are two groups of people sitting right in front, have not clapped nor stood up in ovation. One of the groups consists of the judges from the Supreme Court. 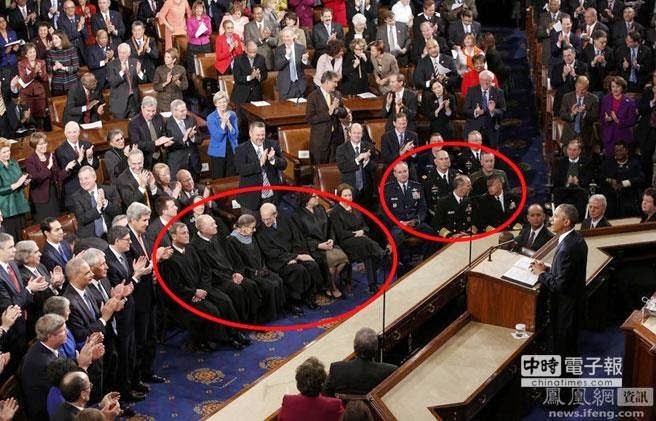 They represent the Judiciary Power of the country which is separated and independent of the executive power. They will not show any support or opposition to the President and they will always remain Neutral, especially in public places like this one. The other group consists of the Army generals, Chief of Army etc from the military. The military will maintain NEUTRALITY in political setting like this unless the speech has touched on military issue or perspectives. This is how the Americans take Separation and Independence of Powers so seriously, in which becomes the tenets of the Democratic foundation of the country. Democracy is not just about having elections every five years or a system with institutions like Parliament, President and Civil Service. It is MORE than that. Rule of Law can only exist if and only if the Judiciary is fully INDEPENDENT from the interference and meddling of the Executive in the selection and appointment of judges and officers. Thus, I cannot understand why even some opposition politicians have supported the notion that Rule of Law exists in Singapore when it is obvious that Executive power has been interfering tremendously in the Judiciary appointments. The examples of late JBJ and Michael Khoo are glaring examples of Executive interference in the Judiciary staring at our faces! Singapore is NOT a Democracy by any standards, even though there are regular elections every 4 or 5 years. The Elections Department is NOT independent and the ruling party has without fail, consistently interfered with the redrawing of boundaries each and every GE. Such Gerrymandering is definitely not Democratic at all. The Press and CPIB were totally under controlled by the ruling party, with direct appointment of PAP members right into the management boards of all the main stream media. CPIB was put directly under PMO. These two arms should be INDEPENDENT and separated from the ruling party influence as this is part of the Supervisory organs of the political system. So it seems that ALL the FIVE Powers of the system are being manipulated and interfered by the ruling party. How can this be called as a "Democracy" at all? A lot have been said about the AHPETC saga for the past weeks and both PAP people and WP people have been trading massive punches and blows at each other. Although there is a large group of middle ground voters who form the Silent Majority (they really aren't the majority but just king makers), but very few have put up criticisms of BOTH PAP and WP. Regrettably too much public resources have been wasted in parliament to debate on such primarily municipal issue. It is really an unique feature of Singapore political landscape. While I believe there is really something very wrong with WP AHPETC management, so much so that I have predicted more than a year ago FMSS will become the key problem which may cause WP political trauma, but I guess PAP has always been very bad ruling party with bad governance practices embedded in its management of Singapore. WP people have pointed out such glaring bad examples and rightfully so, it is just the pot calling the kettle black. However, two wrong doesn't make one right. We should not be stuck with a political system which political parties are just competing on who is worse than the other. This is not the kind of Democracy I want to build for Singapore. Both PAP and WP deserve a big tight slap on their heads. It is also important to take the opportunity to advocate and educate our fellow Singaporeans what we really need to do to make Singapore better politically. I have always dream my dream of Democracy. A Democracy which has true independence and separation of powers. This constant accusation of both PAP and WP of conflict of interests has its roots of the lack of the Democratic Core Values and Principles of Independence and Separation of Powers. On the macro perspective, this refers to the Five Powers. This is the ideal of Dr Sun's Separation of Five Powers in a political system. This refers to the power granted to the ruling party to execute their policies with the help of the civil service. The Judiciary system which includes the courts, judges, lawyers etc. Includes Free Press, corruption investigation Burea, Auditor General Office or any organization that scrutinize the Executive to keep all processes legitimate. This refers to the organizations which make sure the selection or election process of various personnel like civil servants (PSC), appointment of key personnel to various key institutions and the Election Department which oversees the election of parliamentarians etc are fair and just. Only when these five powers are working independently without political interference from politicians or anyone else, then we can achieve a fairly good Democratic system that will uphold the Rule of Law in all aspects, with less cronyism and massive conflict of interests that will go unchecked. If you put the idea of Separation and Independence of Powers in the case of the AHPETC, you will realize that the major problem is the lack of such Democratic system installed that devoid the organization ofproper checks and balances. The Executive Power lies with the Management Agent along with the Chairman and Vice Chairman. The Judiciary power lies with the Board of AHPETC which includes all the MPs, Town Councilors and key AHPETC personnel like GM and Secretary. Legislative Power is based on Town Council Act and laws passed by parliament. SUPERVISORY power lies with auditors as well as MND. But for the daily running of Operations, the TC should have proper committees to supervise the work processes. The Selection Power lies with the tender and appointment process. Unfortunately for AHPETC, there are too many intertwined relationship in the different powers, particular in the Selection, EXECUTIVE and SUPERVISORY powers. There is no deliberate efforts made in avoidance of conflict of interests. This is the crux of the matter. Many people see this AHPETC saga as a matter of carelessness or lapses but I view it as the lack of Democratic Core values. For anybody with strong belief in Democracy and its Core values, he would not have allowed such a system that lacks independence and Separation of powers to run the TC. For a matter of fact, PAP is guilty of such Gross disregard of Democratic Principles and that is why we are fighting against it. But for WP to emulate PAP totally in this aspect is really unthinkable to me. What pains me most is that fact that many WP people and opposition supporters are ignoring this more important problem of the lack of Democratic values in both parties altogether. It seems that we are very far from our Democratic Dream if our own people do not care much of what our Core Values are but only focusing intensively on the politicking and attacks on PAP.